But why would catching in the bullpen, not even a game, cause problems for Josh? It’s just warm up, right? Having trouble throwing in the bullpen, in warm up, and around the bases is all rooted in fear of embarrassment or what others might think. One bad throw leads to worry about making more bad throws and what teammates and coaches will think or how they might react. This leads ball players to go to what I call a “safe throw,” which you might think of as a soft lob. With the lob throw, you have less of a chance to look silly because less chance of embarrassment. But in many cases the lob starts to become inconsistent due to over control and thinking too much about a bad outcome. Sound familiar? “Right on Dr. Cohn, but what’s the solution?” you ask. 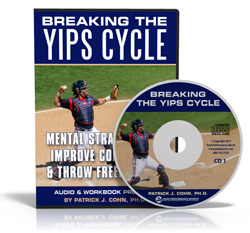 The main goal when you have the yips is getting back to throwing freely, intuitively, and using your “normal” throw with pace. You don’t want to reinforce the safe throw or lob. This keeps you stuck in the mindset that you can’t use your normal throw and it’s feels safer to use the lob. First, you have to focus on hitting your target and not avoid a negative result, such as spiking the ball. Keep the images in your mind positive. Second, let go of the worry about what others will think if you make a bad throw–that’s too much pressure–and often irrational. 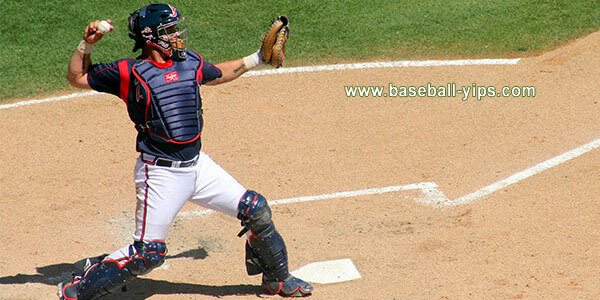 Stop focusing on the mechanics of throwing or over controlling your release or arm slot, for example. 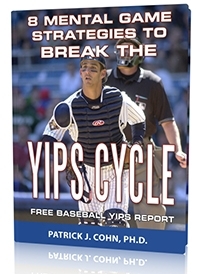 And if you want more help with overcoming the lob throw, contact me about one-on-one mental coaching for the yips.